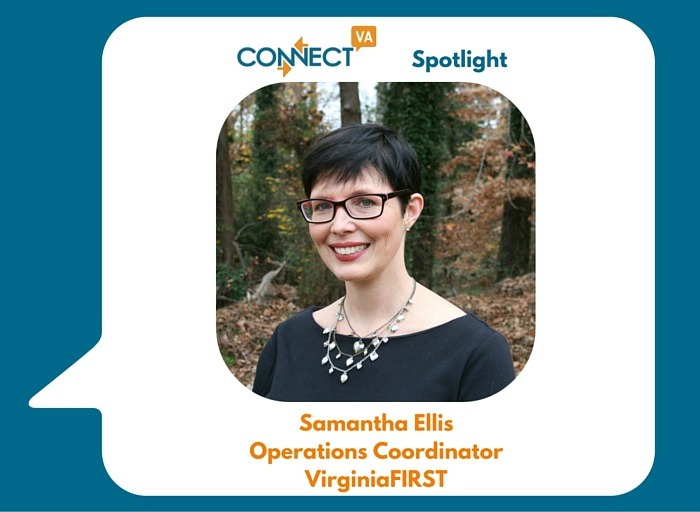 Get to know Samantha Ellis, Operations Coordinator at VirginiaFIRST and this week’s ConnectVA Spotlight! I am Samantha Ellis, Operations Coordinator at VirginiaFIRST. I’ve held a variety of positions in the non-profit/museum realm, including Executive Director of the VA Fire & Police Museum, Prospect Researcher at the VMFA and the Library of Virginia, Asst. Archivist at the C&O Historical Society, and Special Program Assistant with the Virginia Association of Museums. I have a BA in Historic Preservation from University of Mary Washington and a MA in Folk Studies from Western Kentucky University. Although my career path did not stick with these majors, the skills I learned in college/university have been highly valuable and translate far beyond their seeming scope. Rejoice, all you with non-traditional college degrees! VirginiaFIRST is a 16 year old 501(c)(3) organization that brings STEM-based leadership enrichment programs to youth in Virginia. VirginiaFIRST uses robotics as the “vehicle” to reinforce STEM-based concepts and teach valuable life skills such as leadership, creative thinking, and teamwork. Each year VirginiaFIRST provides resources and support to over 10,000 k-12 students and outreach to over 40,000 individuals in Virginia, DC and Maryland. I support the Administrative and Development arm of VirginiaFIRST, overseeing the daily operations of our organization. Working in collaboration with the VirginiaFIRST staff and VirginiaFIRST Board of Trustees, my duties include database maintenance, prospect research, web site content management, communications, procurement, and the production of monthly newsletters. It’s very exciting to see kids of all ages and socio-economic backgrounds who are fired up about science and learning, who work to do their best while encouraging others to do the same, and who are supported and uplifted by adult coaches and mentors. Smart is cool! Our FIRST Tech Challenge (FTC) competition season for middle and high school robotics teams starts in December, which is very exciting- that’s where you see the kids in action, working and having fun. The meets are full of energy and music, crazy costumes, comradery, and fantastic robots. It’s fabulous to watch- and free for spectators! ConnectVA has been a valuable resource for advertising our job openings to a target audience. We have also used ConnectVA to secure donated materials for our new 12,500 competition space and headquarters in Mechanicsville. If you have a passion for encouraging young people, we would love to have you volunteer with VirginiaFIRST. Our competitions require approximately 75-150 volunteers, who encompass a wide variety of skills. Whether you are non-technical or an expert in programming, engineering or electrical design, we have a need for you! Time commitments range from one day events to weekly meetings with a team.